This school year has been full of farm to school activities, all over our region. From the local sourcing and cafeteria taste tests done by our fabulous Child Nutrition Directors, to the many school gardens, chefs in classrooms, and hands on educational opportunities provided by teachers, volunteers, and other community members, farm to school is thriving in communities across WNC. Through ASAP’s Farm to School program we have been able to see the impacts of these experiences first hand. In an end of the year parent survey, 74% of the families said that farm to school has had an impact on how their family eats or thinks about food and 70% say that their child is more likely to try new vegetables. The open-ended questions on the survey help to tell the bigger story. “We are now growing a garden in our backyard,” one family reports. “My son has learned two recipes this year that we MUST make at least weekly. He loves the apple-carrot salad – it is his favorite dessert ever!” says another. This is but one success story, making the case for providing positive experiences with healthy food. Though we are reporting on a good year for child nutrition services, we have to start on a sad note. Christina Dodd, Child Nutrition Director for Henderson County Schools, is resigning at the end of June. We are so sad to see her go, as Christina was not only a big supporter of farm to school, she also was full of great ideas, always wanting to provide the children she served with the best tasting, most nutritious food possible. Fortunately, we have LOTS of great Child Nutrition Directors in WNC doing wonderful things. The big three of WNC – Haywood, Henderson, and Buncombe – are all involved in ASAP’s Growing Minds Farm to School program in a variety of ways. All three districts get their produce from Marvin’s Produce, a produce distributor that works with area farmers to get local product into the 80 schools of the three districts. All three also participate in the NC Department of Agriculture Farm to School program, getting NC product into our schools. 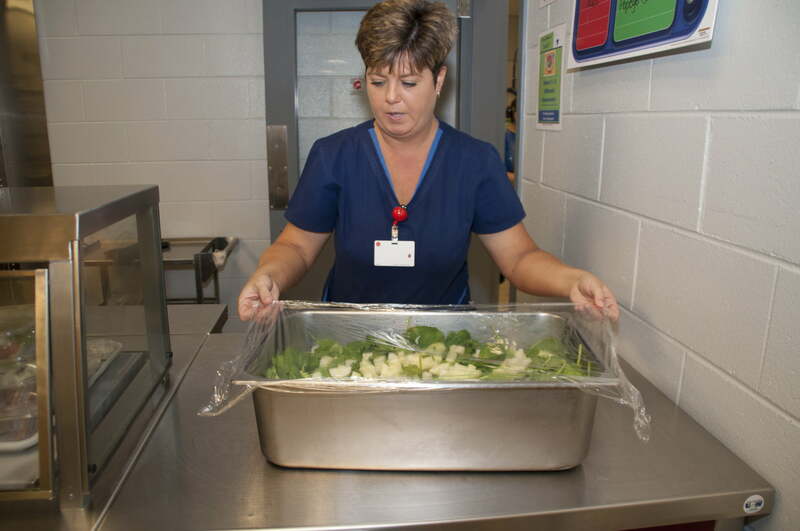 In partnership with Buncombe County Child Nutrition Director Lisa Payne and the child nutrition staff at North Buncombe and Fairview Elementary schools, ASAP has been conducting monthly cafeteria taste tests. Kids at these schools get a taste of a locally grown product each month in the school cafeteria. Last year kids were clamoring for kale chips, strawberry salsa, and white bean spinach dip. In addition to these taste tests, Buncombe County Schools also highlight and promote the local item(s) on their menus, and are always looking for ways to purchase and promote locally grown food. Over in Haywood County, local produce comes to the schools (in addition to purchasing local from Marvin’s Produce and the NCDA F2S program) straight from a GAP (Good Agricultural Practices) certified farm, Seasonal Produce Farm in Haywood County. Haywood County also participated in a project with ASAP, selecting five schools to make connections between the classroom and cafeteria. Child Nutrition Director, Alison Francis, believes in sourcing local products not only for the health of her students, but also for the health of the local economy in Haywood County. Last fall she even sat on a panel at ASAP’s Rural Forum, a day long event dedicated to improving access to local food for rural communities in WNC. These are just three examples of the great work happening throughout our region. Counties throughout WNC are realizing the benefits of purchasing from local farms and emphasizing farm to school educational components. As we move into the summer months these dedicated individuals don’t just take a break. They know that over the summer, when school is out, that many children in our area go without healthy meals. Haywood, Henderson, and Buncombe counties are all providing free summer meals to students. Thank you CNDs for your dedication to the health of children in our region!